Last week saw some amazing public artworks being created worldwide, and you have witnessed their development on our Facebook page. However, before we head to the favorite murals of the past days, let’s see what else is going on in the world of street art. MadC is in London and she shared the story of her UK adventures in the third part of her diary. With two great festivals behind us, we had the opportunity to see some of the best pieces created for the Vilnius Street Art Festival and No Limit Borås in Sweden. We also saw some of the first murals painted in the Dutch city of Breda, part of the brand new Open Walls Gallery initiative. 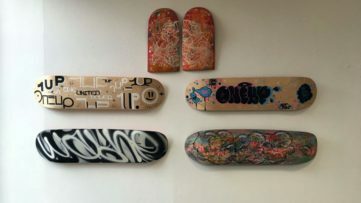 There are some great exhibitions currently on view or about to start soon that any street or urban art enthusiast should definitely check out like OAKOAK’s exhibit at Vertical Gallery, RUN in LA, and the solo show by Finish graffiti pioneer EGS in Soest, Germany. Admirers of Pure Evil are in for a real treat this week. 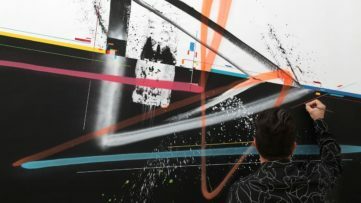 In the wake of his Echoes exhibition, we shared a great interview with the artist, so check it out if you haven’t already. The third edition of Mr. Freeze exposition dedicated to graffiti and street art practices is happening in the French town of Toulouse as we speak. Prior to the expo opening French artist Gris1, member of Da Mental Vaporz crew did an astonishing piece in his signature colorful and funky style. This year’s theme for Mr. Freeze expo is Lost & Found and Gris 1’s animal portrait outlines the theme, as it looks like it is reassembled from the lost lines and bubbles. Except Gris 1, thirty-one contemporary artists gathered for this short-term exposition and celebration of street art in Toulouse, which will close on October 3rd. The latest addition to the One Wall project organized by Urban Nation is the large-scale mural made in Berlin by the Swiss artists Onur and Wes21. 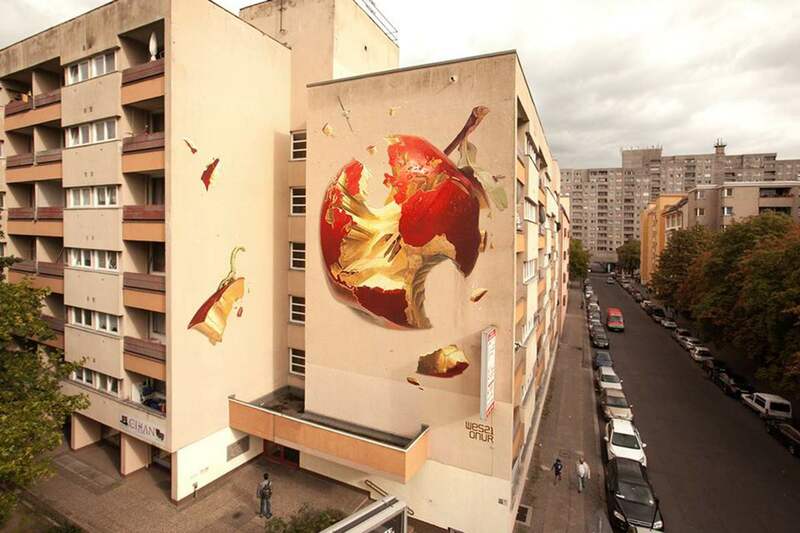 The apple mural is entitled the Sweetest Sin. Although the title might be reminiscent of the biblical myth, the idea was to reflect on the pressing environmental problems of our age. Onur Dinc and Wes21 are both interested in photorealism and as a result, this collaboration turned out to be magnificent merger of their styles and a thought-provoking statement about the human mistreatment of their habitat. Belgian artist Dzia is definitely one of the regular guests in our Street Update section and it is always a pleasure to see the results of his latest endeavors. 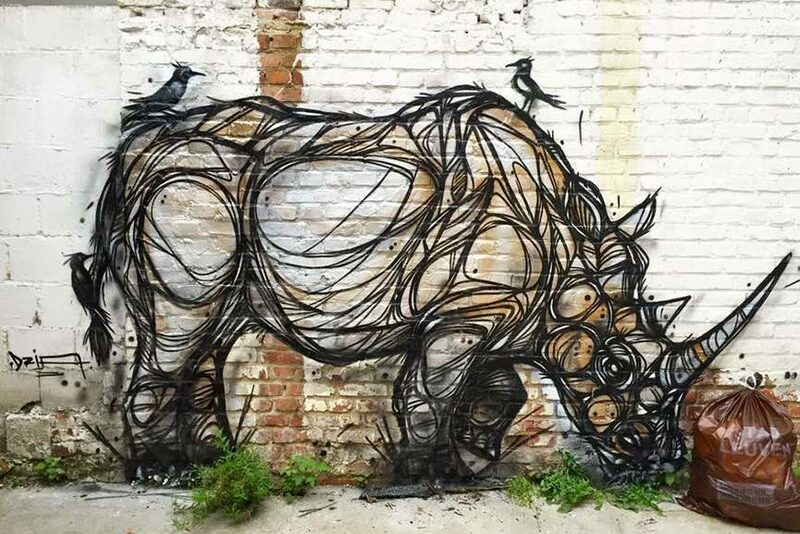 This time he is back with the rhinoceros piece in the Belgian city of Leuven. Cleverly integrated into the background the rhino piece follows the saying One man’s trash is another man’s treasure, and if you did wonder why is rhino so attracted to the bag, this is the answer from the artist. 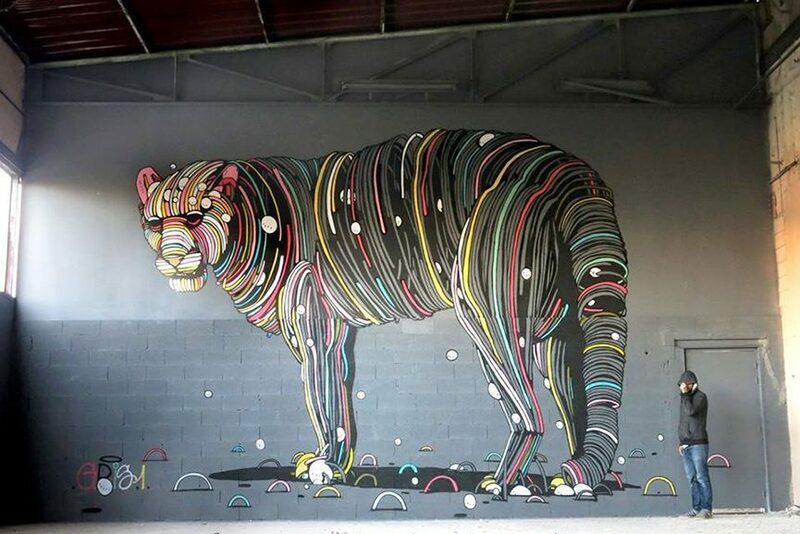 The latest animal piece by Dzia incorporates all the signature elements of his work from the choice of the main theme to the spontaneous lines. Brazilian artist Apolo Torres was in Italy last week where he participated in the Memorie Urbane Festival. 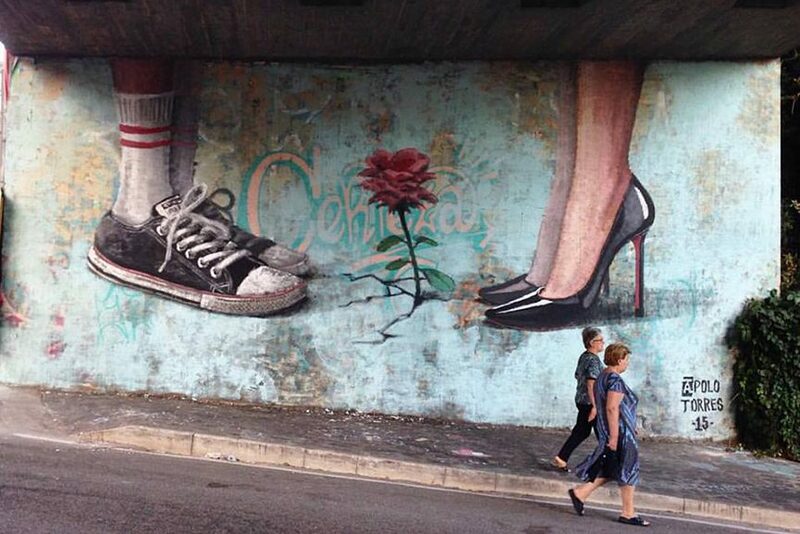 For the occasion, Apolo Torres created two street art pieces. The one in front of you is his second mural entitled Equality. Except from his street art practice Torres also works in fine arts and illustration. The exhibition of his paintings and works on paper will also be hosted by the Memorie Urbane Gallery, in a temporary exhibition space at Piazza Umberto I until the second week of October. 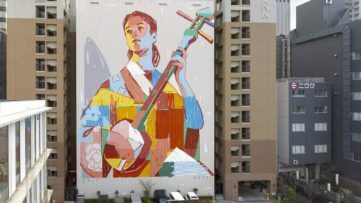 The rising star of the Puerto Rican street art scene BIK ISMO was in Las Vegas as one of the participants of the Life Is Beautiful music and street festival curated by JUSTKIDS. It was the third edition of the festival, which brought together more than fifteen internationally acclaimed artists. 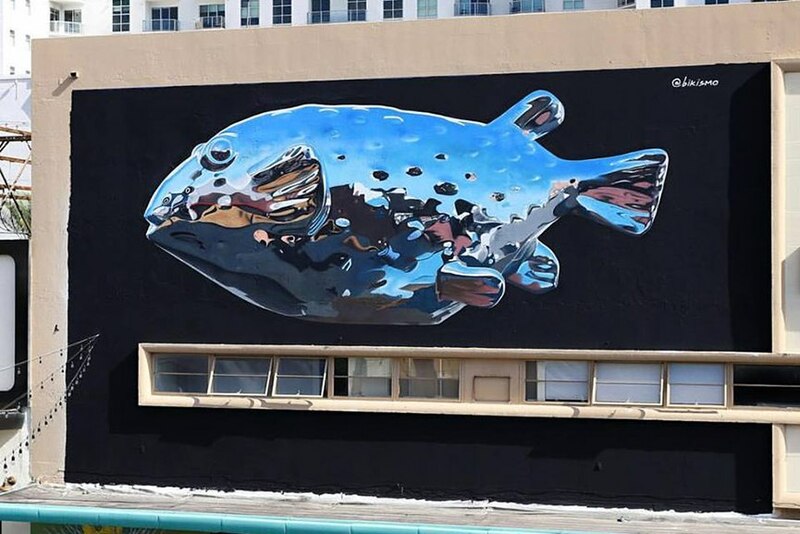 For the festival BIK ISMO created one of his signature 3D animal pieces, this time in the form of a metallic fish on the wall of the former Fremont Medical Building, now transformed into a creative corner by the collective Emergency Arts. Sign up for My Widewalls for FREE and stay tuned for more news from the streets!